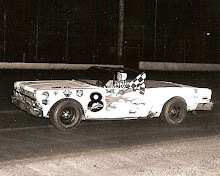 The current season still has quite a while to run, but when he raced here at the Louisa County Fair Mickey said that he and co-partner, Gene Stewart of Washington, plan to stay in late model competition in 1963. “Yes,” Mickey said during his recent visit here. “We’ll run again next year - only with a 1963 Pontiac. Their present entry is a ‘62 model of the same make car. At the present time Mickey appears to be headed for “Rookie of the Year” honors in the IMCA (International Motor Contest Association). As of last week he was sixth in the official point standings, the only “rookie” or first-year driver to be among the top 20 in points. Officials note that Mickey has had more than his share of tough-luck which has prevented him from possibly climbing even higher in the standings. While he has yet to win a feature race, Mickey has been in front more than once, only to run into some kind of trouble. Prime examples are two Knoxville races, one at Knoxville, Iowa and the other at Knoxville, Ill. In the Iowa race, he appeared to be a sure winner, but conked out soon after making a pit stop. The story making the rounds was that a pit crew member “goofed” by inadvertently dumping a can of water into the gas tank instead of grabbing the container with fuel in it. 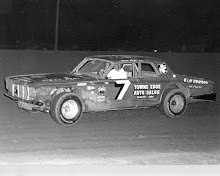 The Knoxville, Ill., race was just the night before the late model races here. There, Mickey pulled out in front and then cracked a cylinder head on his car. To make things even more miserable, the tow truck on which Mickey and Stewart haul their car developed engine trouble en route back to Columbus Junction. Who won the feature here) was Mickey able to compete at all. A quick trip was made to Keokuk and the engine repaired with less than an hour to spare until the races at the local fairgrounds. The tow truck engine also had been overhauled the same time because of the busy schedule ahead. 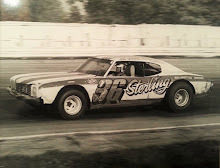 While Mickey is a “rookie” in the IMCA organization, this is his sixth season of stock car driving. 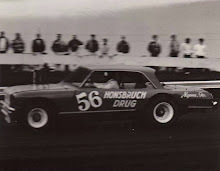 Before going to late models he was an annual contender in the Mississippi Valley Speedway Club’s jalopy circuit. He was the point champion once, second twice and third twice. Mickey, who is on the road most of the time on the racing schedule, does some work at Fisher Motors here, where he’s been employed since about 1954. From now until fall, IMCA drivers will average a race about every other day. State fair time will be their busiest, when they compete five straight days in Minnesota and three at Des Moines. No official figures were available, but one official said he figured Mickey “might be breaking even about now.” They left no doubt, however, that their organization is a profitable one for the top drivers, as Derr earned nearly $30,090 last year. He strictly drives cars for a livelihood and has no other occupation. Prize money also is a lot greater. “The best feature race this year paid off $1,750 to the winner." 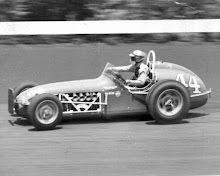 Mickey’s travels already have taken him to such points as Atlanta, Ga., Houston, Tex., Toledo, Ohio, and Minot, N. D. After the races here, drivers raced Saturday night at Donnellson and twice Sunday at La Crosse, Wis. Stewart will accompany him in the tow truck. Keokuk, Iowa, drivers have long dominated the top spots in the IMCA races and Mickey has come to regard them highly. The top spot in John's esteem, of course, is held by Derr. “He really knows this business,” he said, “They’re all tough, though.” Most of the Keokuk men, like Mickey and Stewart, do all their own mechanic work. How does Mickey feel about all the misfortunes that have befallen him even though he's done fairly well so far? “Work on it (the car)” is something. Mickey and Stewart have been doing since last December when they, got it. He estimates they worked on the auto about four nights a week until June 1 and then every day since then. Eventually, Mickey and Stewart hope that their car ""Big John" will really live up to its name despite the fact that Mickey is just 5 feet 4 inches tall and weighs 120 pounds. Is it Ok if I post this on my MVSC website? John was also a Promoter at Columbus Junction after he quit driving. I am guessing it was in the 1980 s when he was a promoter there.